With the warmer weather starting to peak through, getting outdoors is on many people’s minds. Over the last few years, lots of different organisations (including us!) have set up to help Families and children all over Scotland get reacquainted with the woodlands and to get back to basics when it comes to play. I want to take this opportunity to introduce to you some other organisations who are working hard in their areas to do just that – each with their own style, but all with the same goal! Jacqui Frame started ‘Off Grid Kids’ in 2016 and it’s been going from strength to strength. 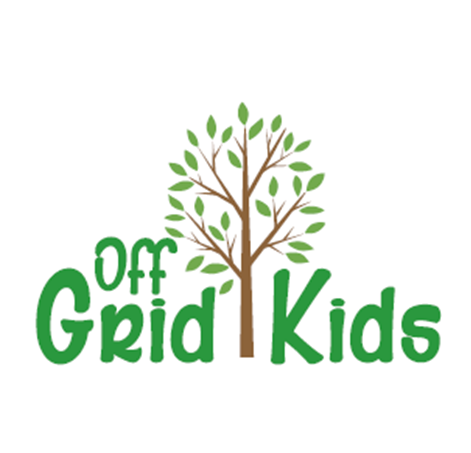 What is ‘Off Grid Kids’? A work in progress J We run an outdoor after-school service & have survived our first winter! We also run weekend Forest School Clubs, Toddler groups & host birthday parties – all outdoors, all year round. I have 2 boys, I was brought up in the countryside and I was worried about bringing them up in an urban environment. I felt they had no-where safe to run and play. I had previously set up an after school, which was more the usual indoor type, and felt children deserved more than spending more time inside after being in school or spending more time on screens. What are the aims and why did you choose them? Our aims are just to encourage children outside and spending time away from screens. We wanted to show them that even when they or their parents felt they were too old to play, that children of all ages could learn to play from each other and make up games from scratch and with very little resources. What makes you different from other types of Out of School care? 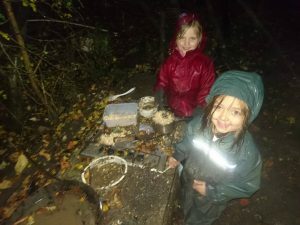 We are 100% outdoors & we have no ‘toys’ or electronic gadgets to fall back on, they children play outside in all weathers, we cook snacks on the fire, they get muddy…very muddy at times….and they love coming to us. We generally don’t get children moaning about coming, but they can complain if they are picked up too early! Were there many obstacles to cross in starting ‘Off Grid Kids’ and how did you overcome them? No, not many, I dreaded the Care Inspectorate process, but they made it very simple for me. We were very lucky, having the location and having access to the Scout Hall should we need it for emergencies, getting changed in, and for storage. I am not sure where else we could have set it up, to be honest. I worried, and still worry, about parent’s perception of being outside all year round, and no one wanting to send their kids – thankfully some parents put their trust in us & we are getting there number wise! I think the main problem is probably me – I want everything to be done perfectly, so I can stress myself out about all sorts of nonsense – I don’t want coming to Off Grid to be a challenge for parents, so I am constantly trying to make changes to make things a bit simpler for them. Mud is a problem because some children come every day after school or a few times, so trying to get clothes just dry for the next day can be a pain especially if coated in mud! Talk me through your experiences so far..
We have survived winter for the 1st year, and it has been enjoyable, I think that is the overriding thought at the moment, it was the thing I was really worried about, but its passed, we are in Spring now! The kids truly do enjoy coming along, it is after school, so it is forced on them, and they have to come whether they want to or not, so I always really appreciate when the kids are having fun and you can see that, I don’t ever want to take that for granted! The proof is in the pudding, one of my sons comes every day, and hasn’t started to complain just yet! Oh and we won a Play in the Community award last year – that was quite nice. Have you noticed any changes in the kids since joining you ? Yeah, we have some older boys who started off unable to play. All they had done previously in their lives was play football – it’s quite sad how that can take over kid’s lives – but now, they have started being much more involved in group games. We have the younger ones who were not allowed to get dirty, and the girls who thought mud was just for boys, but now are as bonkers as some of the boys at spending more time down on the ground than standing up! We have children who struggle with friendships and integrating with other children, when you get that moment of breakthrough and they start playing with other kids, it really does make your day. What has been the response locally? Really positive on the whole – We get very positive feedback from those who use the service and weekend clubs – there is always a sigh if we have to take a break for a few weeks between clubs running – the parents and children love that 2 hours of outdoor play! We are trying to create a community feel about Off Grid Kids, we want others to benefit & have arranged a litter pick, and are working with a local charity for adults and children with additional support needs to be able to be more involved in outdoor activities. 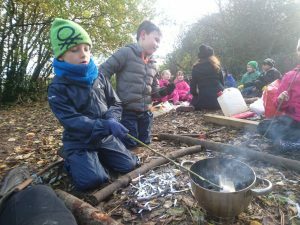 What advice would you give to anyone interested in getting involved in Forest School/ Natural Outdoor Play? You get back what you put in, it is hard work but very rewarding at times – you have to be happy to think out of the box at times to work around issues but I wouldn’t change it for the world – who would want to be inside when you can be out and enjoying a natural playground! Watching and listening to the children & then seeing them run away when parents come to get them! We are now a FSA Recognised Forest School Provider!